This necklace is made use of by lots of folks (particularly in middle east) to keep the evil as well as bad forces away yet constantly have the excellent karma enter your body conveniently. 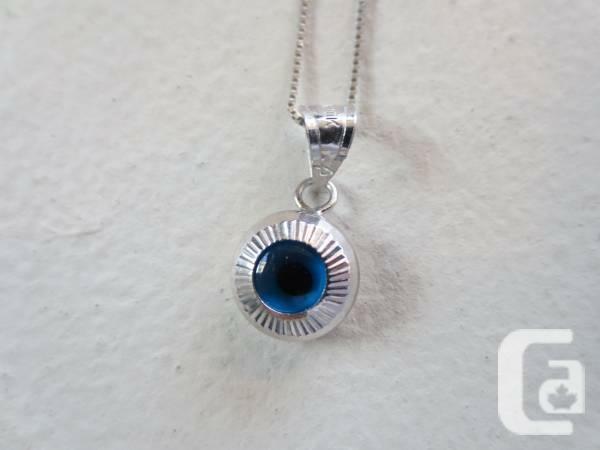 The necklace is called wicked eye. The box chain is 18 inches. They are both 10k white gold. The necklace was $71 and also the chain is $51, if you prefer to purchase them independently. They are both brand name new and the box is right here too. The cost for both with each other is just $99 (I insist on this price), just since I prefer to sell it soon. If the add is still up means it is still right here, kindly note. No paypal, no shipping and also no bargening. Must be gotten. Gorgeous 18 carat tri-coloured gold necklace, approximately 17 inches long. Great for everyday wear. Asking $550. lovely vintage memory-wire necklace, smallpale pink, clear, purple and burgundy beads . 925 Necklace and Matching Bracelet Made In Italian. Hearts are detailed on these two pieces. Ladies 10K Yellow Gold Sunset Topaz Earrings and Necklace accented with diamonds. New. Ladies 10K Brushed White Gold (Not Plated) Ring Has a Beautiful Blue Stone. Size 6-6 1/2.